Hunter's image taps the fear that still seeps the Fields, even though its south edge leads to Broadway Market, E8's area of sudden, sharp gentrification. 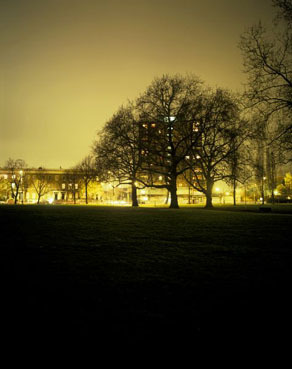 'Walking across the park's open spaces after dark becomes a gamble with life itself,' he says. 'This violence is all but forgotten now on a sunny Saturday afternoon on Broadway Market, where the boarded up and derelict buildings have been transformed into havens for latte-swilling mums and their 4x4 buggies, with talk of dole queues and violence drowned out by tales of huge property deals and profits.' Which gets to the crux of this uneasy social shift: sneering is easy at life-by-Farmers-Market, but who has fondness for the social malaise it now overrides?